Realty Inspection Services Home Inspector Paul Viveros noted this issue on his report today. The two doors in this picture were installed in a manner that will allow the doors to collide.Notice the door on the left has glass panels. If the doors collide there is potential for the glass to break. Findings like this make a home inspection worthwhile as many of us would not notice this until an accident had occurred. 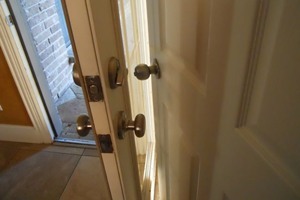 Go here http://realtyinspectionsdfw.com/?cat=7 to see other Safety Issues that we have posted. Are you ready to book your home inspection online and save $25.00? Simply click on the BIG RED BUTTON on the top right of this page.